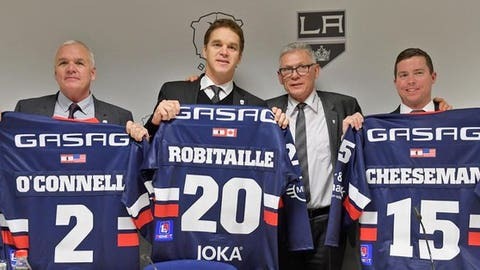 Luc Robitaille in Berlin for the announcement. The Los Angeles Kings will now oversee all operations of Eisbären Berlin Hockey, it was announced Monday at a news conference at Mercedes-Benz Arena. Eisbären Berlin of the German Ice Hockey League and the Los Angeles Kings of the National Hockey League are owned and operated by AEG Sports, a division of the Anschutz Entertainment Group. The LA Kings will now begin leading all hockey operations and administrative matters, directing the day-to-day leadership of Managing Director Peter John Lee. Lee will report directly to LA Kings President, Business Operations and Hockey Hall of Famer Luc Robitaille. In addition to Robitaille, Lee and his team including Thomas Bothstede (Director Business Operations) and Stefan Ustorf (Director Hockey Operations) will also work closely with LA Kings and AEG Sports Chief Operating Officer Kelly Cheeseman, as both Cheeseman and Robitaille have been named to the Eisbaren Berlin Board of Directors, with Robitaille being appointed president of the board. They join the Board of Directors which already includes Jan Kienappel (Managing Director & Chief Financial Officer, AEG Germany), Olaf Bruell (Vice President Legal & General Counsel, AEG Germany), Alex Hill (Chief Operating Officer & Chief Financial Officer, AEG Europe) and Michael Hapka (Vice President & General Manager, Mercedes-Benz Arena, Berlin).